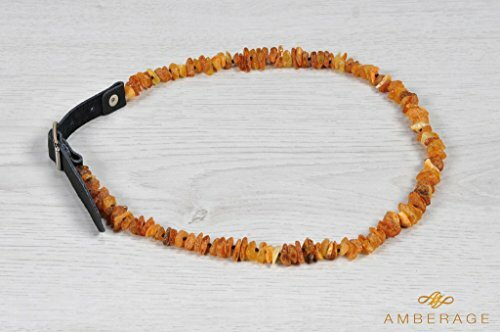 Amber dog collars is 100% handmade from natural Baltic amber. It is special made for daily use. Absolutely natural: without chemical or insecticides inside. Special designed for dogs and cats. Amber necklace jewelry looks simply fantastic on every dog or cat. Also amber necklaces jewelry now comes on the top of fashion Organic Amber is natural tree resin fossilized over millions of years. In fact, holistic properties of amber are known for thousands of years. Amber collars are worn by millions of men, women and children every day around the world. Amber also is natural anti-allergen, so why 90% of people believe that it actually help to protect pet from allergies ,pain and inflammation reduction, improved sleep and reduced stress. It is perfect present for pet lowers! You can choose from 6 sizes which are suitable for all pet species, ages and size. Choose amber dog necklace jewelry for your pet and be stylish together with him! The large majority of approx. 95% of our customers are very satisfied. HANDMADE from 100 % the Natural Raw Baltic amber (Made in Lithuania).Can be used for dogs , puppies, cats and kittens, even if they are allergic, pregnant or nursing. Perfect gift for pet lowers- looks very cutie on dogs or cats. If you have any questions about this product by Amberage, contact us by completing and submitting the form below. If you are looking for a specif part number, please include it with your message.